Rabbi Matityahu Glazerson is a Torah / Bible Code Researcher. About 5 Months before the US Presidential Election he published a video showing the codes that Donald Trump will be elected as President of the United States of America – 8th of Cheshvan 5777 – corresponding to the Date of the US Elections in bible code. Four months later he demonstrated the codes again. The Torah Codes are taken from the 5 Books of Moses Text. Using a computer, the text is searched for equidistant letters of words. Like the sentence – “You are a very great person.” Starting from the letter “Y” in “very” and counting every 2 letters – in the sentence “you are a verY gReAt PeRsOn”, we get – “YR A PRO”. Rabbi Glazerson / מתתיהו גלזרסון found the words in Hebrew – “Donald will be elected”, “Seven” & “Heshvan” / the Jewish Month in Which the Election took place. 5″777″ the current Jewish Year. The 7th of Heshvan 5777 is when the elections took place. “President”, “USA” and “Trump” were also found in close proximity. The discrepancy between the dates is easily explained – one code says it was on the 7th of Heshvan & the other says it was the 8th) The US election took place on the 8th of November. A Gregorian Calendar Day starts at 12:00 AM – Midnight. A Jewish Calendar Day Starts at Nightfall. So the 8th of November spans two Jewish dates – the 7th of Heshvan (day) & the 8th of Heshvan (after Nightfall). 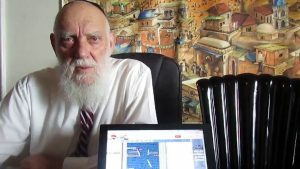 Rabbi Glazerson published other videos and documents on current events including Hurricaine Mathew, The Iran Deal, Nibiru Star Warning – the Star that is Approaching the Earth – that Some say was the same star that was close to the Earth Time of the Flood of Noah, 9/11 & the Twin Towers and many other current events. He also wrote books on the subjects of The Hebrew Alphabet, Building Blocks of the Soul: Studies on the Letters and Words of the Hebrew Language, The Mayan Culture and Judaism, Bible Codes and Kabbalah, Light Out of Darkness: Surviving the End of Days, The Mystical Glory of of Shabbath and Festivals, Time for Redemption, Letters of Fire, The Secrets of the Haggadah, The Twin Towers in Torah Codes, Revelations about Marriage, Repentance in Words and Letters, The Torah Codes and Israel Today, Torah Light and Healing, Through the Lens of Gematria, What’s In a Name, Hebrew Source of Languages, Riches and Righteousness, From Hinduism Back to Judaism, Torah Codes, The Holocaust in Torah Codes, Above the Zodiac, Music and Kabbalah. The Torah was given to the Jews over 3,300 years ago. As the Divine Document, the Torah – given by G-d who is Omniscient – it contains information on all History. The Torah Codes Contain information on Rabbis that have lived in the past Millennium. A Study in The Statistical Science journal – describes the research done and statistical validity of codes. This entry was posted in Torah & Current Events and tagged Torah Codes by admin. Bookmark the permalink. Rabbi M. Glazerson still involved in the future of America! I think he has a website.